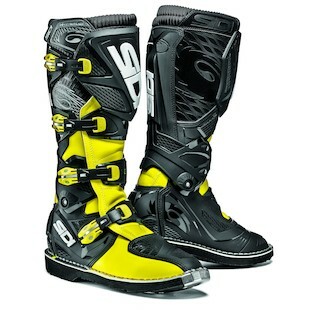 Unlike the discontinued Chevy S10 edition by the same name, and apparently an electric bicycle and scooter company as well, the SIDI X-Treme Boots are not intended for the pleasant and mostly predictable nature of the street. Rather, their reason for being is in getting pushed to their limits in a world of roosting, peg standing, brapp and delivering on that challenge in classic SIDI fashion, which is to surpass it. Like many of SIDIs great recent entrants into this off-road segment, the bulletproof (not literally) SIDI X-Treme includes a hinged ankle, non-bootie design, shankless insole, and pretty much replaceable everything. Taking it a step further though, they have also made it available in Black, Black/Fluorescent Orange, Black/Fluorescent Yellow, White/Black, and White/Light Blue/Back colorways and at a price that represents a giant value for the money. Whether you are just doing occasional dirt adventures, a card carrying AMA dirt rider, or a regular at your local track, the X-Treme boots have you covered and have you looking pretty awesome while doing it. It is debatable that the same could be said for these boots namesakes in relation to their street activities. In short, SIDI has done it again.